On a typical weekday at the museum you’ll encounter a number of things. Marguerite operating the front desk, countless volunteers coming and going, exhibits being laid out. Yet if you take the time to head down to our basement you’ll most likely find Walt Scaramucci working on one of our countless horse or farm life pieces. We have been lucky enough to have Walt volunteering with us for the last several months and he brings with him a knowledge of farming and horse equipment that our staff was sorely lacking. He has tackled a variety of projects since starting with us. Starting with cleaning, conditioning and organizing work harnesses and horse collars, he has also performed cleaning and repair work on one of our horse-drawn sleighs and our surrey. A few weeks ago he even showed up with his arm in a sling, ready to help out after spraining his shoulder. 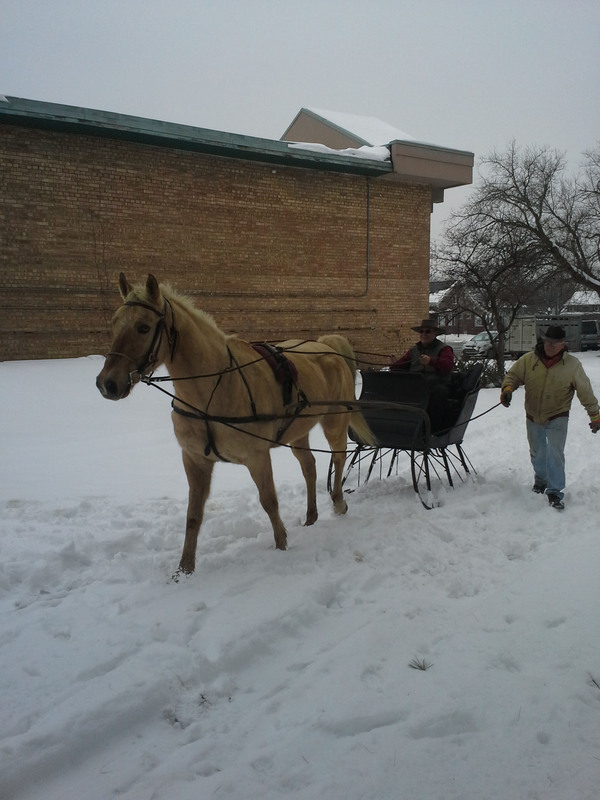 Recently, he showed up to the museum with his horse and hooked up the sleigh he had performed restoration work on. 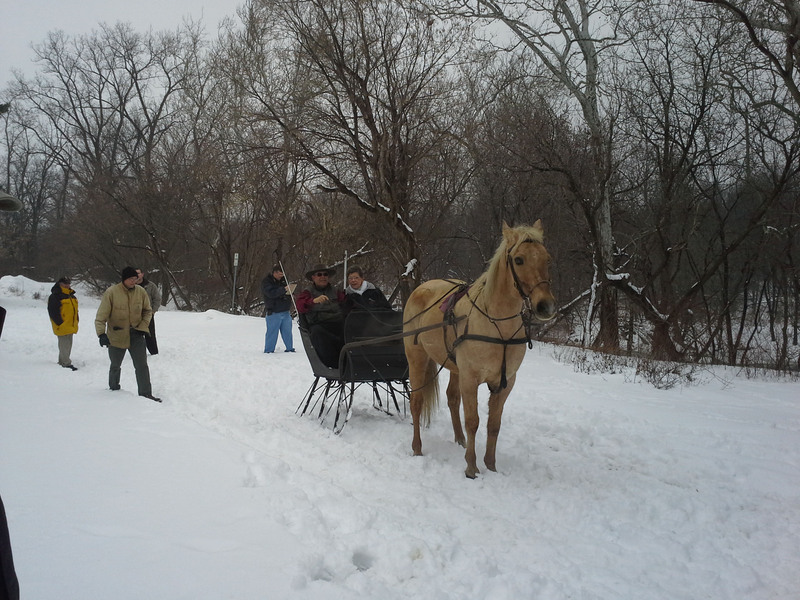 He then went for a ride around the museum grounds. Walt always seems to have a project on his hands, so I was lucky enough to get a chance to sit down with him (in a Surrey he helped repair), to have a chat with him about his time with us at the museum. Why did you volunteer at the Dearborn Historical Museum? I wanted to get involved and contribute something to the community and I figured this would be a good place to start. I actually applied first to another institution and they gave me a bunch of forms and it didn’t look like anything I would really be interested in, so then I tried here next. Well I have lived around here and I have seen it many time. You know what really peaked my interest? That clay wagon (in front of the McFadden Ross House) that has been deteriorating for the last 20 years, I have watched it slowly fall apart. There is hardly anything left of it. I said, “you know, somebody should do something about that.” So I figured that one way or another I might be involved in fixing it. And low and behold it might be our next project. When I went to the office to apply for volunteering, they said “well you could be a greeter and show people through the museum, or we have a bunch of old harnesses and stuff like that that needs some work and I said “I think I am your man for that.” So that’s how I got started. I think it has been fixing up a small hand-made horse and stagecoach model. How long have you lived in Dearborn? Since 1955, actually since 1954. We first lived with my aunt in west Dearborn when we first came from Italy. My mom and I, my dad had already been here a year and then we moved to a rental house in east Dearborn. In 1957, my dad bought a house on Ternes Street just north of Hemlock and after I was married I moved out here to west Dearborn. What part of Italy did you and your family come from? About 90 miles or so North of Rome up in the mountains. We had a small farm and my dad was a wood cutter. We’d go up into the forests after the lumber companies had taken the biggest part of the trees, the big trunks and they leave all the branches and small stuff. He’d go over there, cut and load them up onto the mules and bring them down, load the wagons and sell them in town. When did you becoming interested in working with horses? Well I grew up with mules in Italy, so over here I didn’t have a chance because I lived in the city. But I loved watching all the westerns on television because they had all the horses, they were otherwise known as horse operas. I grew up watching Roy Rogers and the Lone Ranger and Gene Autry. I wanted to be a cowboy. When did you get the chance to have horses and ride? I used to ride at these riding stables every chance I got when I was in high school. And then I went to college at Michigan State and I bought my the first horse of my own, Rocky. Some people save up for a car, you saved up for a horse? What do you think the museum should strive for? Well you have all these beautiful buggies and cutters that are just in storage, it would be nice if we could convert that storage space on the other side there, to have some kind of display area to at least show these off, I think that would be nice. Yeah, I really enjoy working with the other volunteers and I have learned a lot from them. We share the workload and get involved in different projects. It is really enjoyable sharing knowledge and working together with them. You constantly learn new things. Thank you Walt for all you have done for the museum. Walt gives DHM Office Manager Marguerite Baumgardner a ride. Below is a letter to anyone and everyone who might have some time to help us with a very worthwhile endeavor: the 2014 Pioneer School Program. Please contact us at the email or phone number below if you have any interest or questions. We are putting the final touches on the 2014 Pioneer School Program. We are asking for your help with the program. We start on Friday, March 14th and run through Thursday, May 29th. We only schedule morning programs, from 9am to 11:30am. We need 6 volunteers each day: 1 Bus greeter; 1 for Butter Churning in the Ross House Kitchen; 1 for the Gardner House; 1 for the Planting Demonstration and 2 for the “One-Room school house” presentation in the Ross House Pioneer Room. We have set 3 training dates: Monday, February 17th and Wednesday, February 19th at 10:00am and Thursday, February 20th at 2:00pm. We would like you to experience the program. If none of the training dates work for your schedule you can shadow the presenters at your convenience. We ask that you call or email to let us know if you can participate and what training date works for you. Office phone 565.3000 and mbaumgardner@ci.dearborn.mi.us email. We thank you in advance for considering participation in our program. February 5: Lecture will still be held at McFadden-Ross House 7 p.m. The lecture scheduled for tonight, Henry Ford and the Richmond Hill Estate, will still go on as planned. If you have questions, please call the Museum office at 313-565-3000.